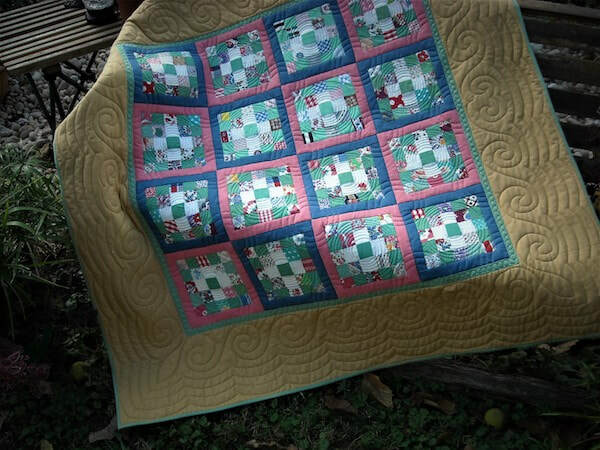 ​I have been quilting 40+ years, self taught, the only quilter in my family as far as I know. I don’t remember what drew me to the craft, but I was caught by the “bug”! I bought a vintage two-rail quilt frame 30 years ago at an auction and hand quilted on it for many years until I bought a new fangled three rail frame. I’ve lost count of the number of quilts I have done for family and customers. I’ve paid that frame off many times. I still hand quilt everyday; it is my time of day when I can relax and regroup. About 7 years ago I took up longarm quilting. I have a passion for both art forms. I used to think machine quilting was cheating and wouldn’t consider even looking at the fancy machines at quilt shows. I had collected many vintage tops from various auctions, yard sales, and flea markets with the intention of hand quilting them the way “they should be”. I’ve done a few by hand but way too many remained unfinished as I was busy finishing long forgotten tops brought to me by people that found tops made by long passed relatives. Then one year I attended MQX (Machine Quilters Expo) in NH and sat in a lecture by Mary Wilson Kerr and her words gave me permission to machine quilt all those tops sitting in drawers and closets not being seen or enjoyed. A whole new world opened to me that day and I have not stopped. I enjoy finding those less than perfect tops and giving them new life with traditional and sometimes contemporary quilting. Now they are finished and being used and loved. I also love finding leftover vintage blocks and piecing them into modern settings and the best is when I can combine them with my other love – KFC fabrics. And no, that is not Kentucky Fried Chicken, but Kaffe Fassett Collective which comprises the designs of Kaffe Fassett, Brandon Mably and Philip Jacobs. I’ve been lucky enough to take a few workshops with Kaffe and Brandon; their love of color and design are infectious. I have found social media to be a huge resource for interesting projects, inspiration, encouragement, support, and friendship. I joined a small group of 12 other KFC lovers from all over the world and we participated in a swap. We made each other a block and sent them to each other to be opened on Christmas morning. It was one of the highlights of my day that Christmas to sit and open and enjoy all those blocks from around the world. To this day we have participated in a few other swaps and remained close friends. Another project was with a vintage group, at random 20 or so were chosen to receive a small vintage linen and we could quilt as we saw fit. When finished the pieces were sent to the organizer of the project and that collection toured the US for a year. I was also fortunate enough to work on a project organized by Mary Kerr, a Quilts of Valor project. She sent donated vintage tops to 12 longarm quilters to quilt as desired; those quilts are now touring the country for 2 years and at the end of their travels will be auctioned to benefit veterans. Another project in my future is to quilt a top for Philip Jacobs. When we found out he did not have a quilt from his fabrics a group was organized and a top was made. Recently I have quilted some projects for Free Spirit Fabrics and Timeless Treasures. Quilting has been a major part of my life and I never tire of the possibilities. I am ashamed to admit how many projects I have in various stages, not to mention those still in my head – sometimes keeping me awake at night.